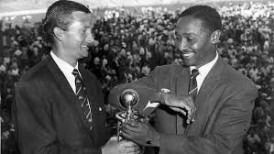 Richie Benaud and Frank Worrell admire the eponymous trophy in 1961. As I mentioned in this piece the first cricket book I ever read was my dad’s copy of AG “Johnnie” Moyes account of West Indies’ tour of Australia in 1960-61. It dealt with a tour brim full of thrills and controversy, but most of all with good-natured sportsmanship and a stated desire to provide some much-needed entertainment to the cricket-watching public. This was in stark contrast to the then rather dour state of Test cricket. To a wide-eyed youngster, the events described therein, together with the brilliant photography, transported me to a world of hot weather where calypso cricket had been played. The famous photo of the fall of the final wicket at Brisbane, taken by the Melbourne Age’s Ron Lovitt, was burned into my memory from the first day I laid eyes on it, as was the sequence of three photos depicting Lance Gibbs’ epic hat-trick in the fourth Test at Adelaide on Australia Day, of all days, his leaping body seeming to reach new heights with each successive appeal. The scene for this was set when Richie Benaud, in his guise as columnist for the Sydney Sun, met newly-appointed West Indies skipper Frank Worrell as he flew on to Perth. As Worrell left, Benaud called “I hope it’s a great summer”; with a smile, and remarkable prescience, Worrell replied “We’ll have a lot of fun anyway”. West Indies first match was against West Australia Country at Bunbury, which was most remarkable for the feats of a “dark-skinned lad” named Willie Lewis. Lewis took the prize wickets of Cammie Smith, Rohan Kanhai and Garry Sobers cheaply, then dismissed the next batsman with a brilliant over-the-shoulder catch. Moyes mentions that Lewis travelled several hundred miles to play but gave no further details. The WA cricket historian Bill Reynolds actually played with Lewis on a number of occasions, indeed he was in the thirteen for the Bunbury match and confirms that Lewis was an aboriginal lad from the Morawa district. Reynolds recalls that Lewis was a genuine fast bowler with an apparently doubtful action which meant that he did not pursue his fortunes in cricket other than in his local district, though the fact that he was never no-balled makes one question the legitimacy of the concerns over his action. The dismissal of Smith had an interesting back-story – when called to action, Smith handed his cigarette to a colleague, saying “Hold this for me”, and was back in time to finish it! A defeat to Western Australia in West Indies’ first full match of the tour confirmed that they were not yet used to the light in Australia, though Sobers was described by Moyes as having certainly worn “the purple robes as one of the kings of the batting art”, a comment not appropriate for Simpson’s necessary but unenterprising 221*. However the performance was overshadowed by grumblings following Sobers apparent unhappiness over an lbw decision which went against him, prompting manager Gerry Gomez to issue a statement that the players would in future accept umpires’ decisions. The ACB and MCC had introduced a month-long moratorium on calling “chuckers”, however the English journalists were critical of Slater’s action in the match with the Australian XI in what was Hall’s first match. The result was a draw that West Indies would surely have won had not their fielding broken down on the last day. After Kanhai badly ran out Sobers, Moyes mentioned a possible rift between the two, which Sobers refers to in his autobiography though denying any bad feeling from his end, while Kanhai for his part had nothing but good things to say about Sobers in Blasting for Runs. Crusoe once described a pitch as a Queen Jezebel, “both fast and unaccountable”, which description Moyes now applied to Hall as the big man accounted for 31 out of 34 extras, including five boundary byes and 11 no-balls. In the next match against South Australia Hall, while still having problems with his run-up, began to find his form with 3/3 in 9 balls, including a lifter which did for Favell that Moyes described as the best he had seen in years. The West Indies fielding, a point of criticism in the past, did not seem to be improving to anything like the level required to compete in Test cricket. Kanhai hit a memorable 252 in 388 minutes against Victoria with Ramadhin capturing a ten-fer on a pitch which was no use to the seamers (a sign of things to come), though Valentine out-bowled him in the second innings. An innings defeat at Sydney by New South Wales did not bode well for the tourists’ prospects in the upcoming first Test, especially as Worrell pulled a muscle and was unable to bat a second time. Harvey and O’Neill both managed centuries, while Davidson’s 88 also helped the home side to an innings victory. A draw with Queensland saw the West Indies struggling in the field once more, though their batting, in bringing up the 200 in 156 minutes, was brilliant. “Hall comes in…Meckiff pulls him high into the outfield…four runs…no it won’t get to the fence, they’re going for the three though…Grout might be…behind the line and he throws himself, and he’s out! Run out! Despite a four-hour bus ride immediately following that strenuous finish at Brisbane, West Indies showed no ill effects with an innings victory over Queensland Country, featuring another ten-fer from Ramadhin, which he bettered with twelve wickets against Northern New South Wales coming into the second Test at the MCG. This Test was, understandably, somewhat of an anti-climax on the heels of that first tie in Test cricket, due in part to the fact that West Indies batting was nowhere near as attacking as in Brisbane. With temperatures reaching 103 in the shade (and a scarcely believable 150 in the centre of the ground!) Australia won a good toss and put West Indies in the field. Debutant Johnny Martin impressed with 55 at number 10, helping Mackay to turn 251/8 into 348 all out. Misson, with his first ball in Tests, had Hunte caught early and, although Kanhai and Nurse took the score to 124/1 rain dampened any thoughts of recovery, the next day seeing the tourists collapse to 181 all out. Davidson, after a sparkling half-century in the first innings, captured 6/63. Following on, Solomon was out when his cap fell onto the stumps and dislodged a bail – given that he had trodden on his wicket at Brisbane, clearly Solomon had a habit of standing too far inside the crease – and Benaud, heckled in the first innings for apparently bowling himself too much, was heckled now for not calling back Solomon, though he had no choice under the Laws. Martin again starred, taking three in four balls, with Worrell’s pair making it three in a row for the elegant West Indian. Sadly for the tourists more rain on Tuesday could not prevent the home side posting a seven-wicket victory. More bad news for West Indies was that both wicket-keepers were injured with less than a week to go to the third Test, though Jackie Hendricks was able to bat with a runner against a Combined XI and made 82. A most notable feature of that match was Bobby Simpson’s scintillating 149 of 194, when no one else could manage 19. The number of injuries which the West Indies had to endure meant that assistant manager Max Marshall was drafted in to play against Tasmania. More brilliant batting in the two matches between the third and fourth Tests nicely set up the match at Adelaide, with the West Indies making no changes from Sydney. Australia, after the heavy defeat of the previous match, made four changes, the omission of Davidson, Harvey and Meckiff enforced by injury, while Martin was also left out, the replacements being Des Hoare, Frank Misson, Lindsay Kline and recalled Queensland batsman Peter Burge. While the temperature soared to 106 degrees, Kanhai’s played a majestic 117 in 150 minutes as West Indies reached a healthy 348/7 at stumps, Australia’s attack clearly depleted by the absence of Davidson. Next morning West Indies took their total to 393 to which Australia, after losing Favell and O’Neill early, responded with 221/4 by the day’s end. Monday was Australia Day, but it seemed more like West Indies’ day when Lance Gibbs took the first Test match hat-trick seen in Australia since Hugh Trumble’s in 1903-04, dropping Australia to 281/8. Hoare helped to add 85 for the ninth wicket as Australia reached 366 all out. West Indies, helped by Smith’s rapid-fire 46, reached 100 in even time, while Kanhai took a leaf from Smith’s book as he reached 59 at stumps with Hunte, after an hour’s start on Kanhai, on 44. Next morning Kanhai sat down after trying to sweep, kicking the ball away from the stumps, after which he went on to become the first to reach 1,000 First-Class runs on the tour and finished with 115, his second century of the match. When Worrell finally declared at 5.15pm Australia had been set 460 to win, but on a lifeless pitch they had no motivation to do so. Nonetheless, three quick wickets put Australia under pressure as stumps were reached on 31/3. When Burge and O’Neill departed next morning at 129, Australia had to bat for 210 minutes with five wickets down and surely no hope. When Hoare was bowled on 209/9 all seemed lost, and when Sobers apparently caught Mackay with still an hour remaining the West Indies proceeded to walk off in triumph. However, Mackay stood his ground and was given not out on appeal. In his biography Slasher Opens Up Mackay responds to criticism from English journalists for not walking, maintaining that it was a bump ball, though he stresses that he is in no doubt that Sobers was sincere in his belief it was a catch. In a finish almost as exciting as Brisbane, West Indies could not break through and when Mackay took the last ball from Hall on his body, he was helped off by the fielders. His 62* in 223 minutes was as vital as Kline’s two-hour stay at the other end, but the feeling at the time was that Worrell, whose captaincy to that point had been beyond praise, had left the declaration too late. So the two teams returned to the MCG for the final Test with the series still tied, and the huge crowds were treated to yet another close finish. Benaud won the toss and put the tourists in to bat but, despite Kanhai once again looking untroubled, West Indies reached stumps with eight wickets down for 252. A world-record crowd of 90,800 on Saturday were entertained early on by Hall, whose big hitting saw him break his bat into three pieces, walking off to replace it with, as Moyes noted, “the look of a man who had suddenly discovered his five-pound note was spurious”. West Indies total eventually reached 292, following which Simpson and McDonald fashioned the first century opening stand of the series, helping Australia to 232/3 at day’s end, a total which would have been even higher if not for the tourists’ fielding. Next day Davidson reached 1000 runs and 100 wickets in Tests, but with their last seven wickets falling for 120 Australia’s lead was only 64, which West Indies knocked off before the end of the day, closing on 126/2. With four wickets down West Indies had a lead of 109, but when Alexander was ninth out it was thanks to his 73 that West Indies had extended their lead to 240, eventually setting Australia 258 to win. Davidson was once more the hero, following a laboured 1/87 in teh first innings with 5/84 while limping badly in West Indies’ second innings, to give him 33 in just four Tests. Grout claimed his 23 dismissal to share in the world record held by South Africa’s John Waite. Simpson started very brightly with 44 in an hour, causing Hall to be taken off after having surrendered 31 in just three overs. So the final day dawned with Australia having nine wickets to give and requiring 201 for victory. The pitch was docile so Gibbs and Valentine opened the bowling, with Simpson able to reach 92 at lunch and Australia decidedly on top. At this point Worrell’s shrewd captaincy came to the fore; having left the slips open, inviting Simpson to cut, the batsman proceeded to hit the ball onto his stumps trying to find the gap. Simpson’s 92 was a fine innings, a horse of a completely different colour to his 221* early in the tour. Australia stumbled somewhat after Simpson’s exit, coaxing a reluctant 55 runs from 39 overs so that at tea they were 205/5, though this should have been 205/6 had Sobers held a simple chance from Davidson. When Davidson presented him with a second chance Sobers this time held on. When Australia reached 254/7 they needed just four more to win; at this stage, one of the most controversial events of the tour transpired. Grout cut the ball and took off, leaving Alexander pointing at the ground where a dislodged bail could be seen. After the batsmen had run two, the umpires conferred and Umpire Hoy confirmed both that Grout had not hit the wicket and that Alexander had not removed the bail. The only other possible explanation was that the ball had hit the wicket, however as Umpire Egar had been unsighted he could not give him out. This clearly upset many of the West Indian fielders, some of whom sank to the ground in protest until Worrell coaxed them back to their feet. Grout set off to walk however Mackay sent him back, but Grout was in any case immediately out – did he give his wicket away? In a chapter of his biography My Country’s Keeper entitled “The Mystery of the Fallen Bail”, Grout puts that idea to rest when he writes “For those who thought a guilty conscience prompted me to ‘go the tonk’ at the next ball and get caught at cover by Cammie Smith, let me say that I was really trying to belt Valentine out of the ground and get those two winning runs with a little private glory.” Despite the fact that Australia need just two more for victory with two wickets to give, as had been seen at Brisbane this was not a given in this series, particularly considering that Martin looked decidedly uncertain. With just one run needed for victory, Valentine bowled to Mackay, the ball passing so close to the off-stump that Alexander threw his arms up in anticipation of a wicket, only to watch in dismay as the winning bye went past him. Because of the Grout incident Australian celebrations were muted, an unsatisfactory end to what had been a memorable series. That was soon forgotten though, and if anything the incident had endeared the tourists even more to the Australian public, as they proved when a hundred thousand turned out to honour the team in a parade through Melbourne. Moyes described the West Indians as “apostles of a new look in cricket”, while Conrad Hunte christened his colleagues “Caribbean Crusaders”. Worrell was honoured at a dinner for the teams when chairman of the ACB Sir Donald Bradman announced that, from this point forward, the two teams would be playing for the Frank Worrell Trophy, while all of the players and officials who participated in the tied Test received a commemorative tie clip. Alexander headed the batting averages, having managed at least one fifty in every Test, while Kanhai and Sobers at times displayed batting brilliance, the former recalling the days of Charlie Macartney. Worrell’s captaincy was described by Moyes as being carried out “almost in secret” but was at all times inspirational. Hall was confirmed as the world’s fastest bowler (as well as one of its most entertaining batsmen), while Gibbs bowled very well. For Australia, Davidson proved that he was the world’s pre-eminent all-rounder at that time, with his bowling (33 wickets at 18.54) particularly devastating, and Simpson also contributed in all facets – his 445 runs, 13 catches and ten wickets comparing most favourably with Sobers haul of 430 runs, 12 catches and 13 wickets. Benaud passed 200 Test wickets, joining Alec Bedser, Ray Lindwall and Clarrie Grimmett as the only bowlers to have done so. And in a fitting finale, the tourists rounded off their tour with a one-day match against the Prime Minster’s XI, featuring Lindwall, Johnson, Benaud, O’Neill, McDonald, Booth and Lawry. The result – a tie.